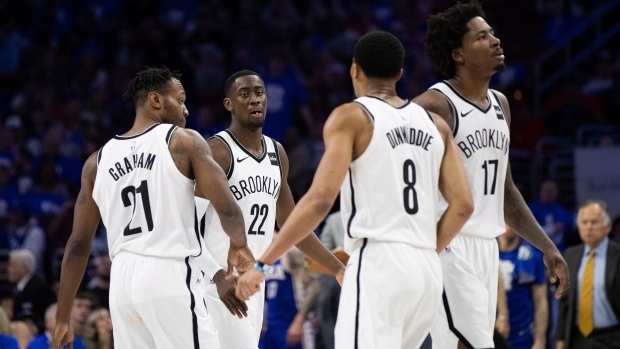 PHILADELPHIA -- D'Angleo Russell flashed some post-season magic, playing like the All-Star leader Brooklyn needed with 26 points, and Caris LeVert scored 23 to lead the Nets to an impressive 111-102 win Saturday over the Philadelphia 76ers in Game 1 of their Eastern Conference first-round playoff series. Jimmy Butler scored 36 points and saved the Sixers, widely considered a favourite to at least reach the East semis, from losing by 25. Joel Embiid slogged his way through 24 forgettable minutes on his bum left knee. Ben Simmons was a post-season dud against Russell, his high school teammate. Russell, who scored 19 points in the second half, can safely scroll through his cellphone to see he's trending. Who knows what the Sixers used a phone for -- benchwarmer Amir Johnson appeared to show Embiid a text when they sat on the bench and the Sixers down 16 in the fourth. Johnson slid the phone into his warmup pants pocket. Poised for a post-season breakthrough, Russell flourished and hit a string of jumpers in the third that never let the Sixers seriously chip away at the lead. LeVert's third 3 in the fourth made it a 16-point game and there was no looking back for one of the biggest wins since the Nets moved to Brooklyn. Russell raised his arms in celebration as he headed down the tunnel into Brooklyn's locker room. Embiid was introduced to a roaring standing ovation and heard chants of "MVP!" and "Trust the Process" when he opened the game with two free throws. But he just wasn't ready to play at an All-Star level for any serious length of time. He was hit with a technical when he shoved Jared Dudley to the ground and went back to the locker room for more treatment with about 3 minutes left in the first half. He scored 22 points -- including 12 free throws -- and had 15 rebounds. Embiid has always fancied himself a 3-point shooter and with tendinitis in his left knee that cost him most of the final month of the season rendering him immobile he decided to camp out a bit more beyond the arc. He missed all five 3s in the half -- and the Sixers missed their first 11. With or without a healthy Embiid, the Nets were about unstoppable for much of the half with the Sixers clearly not ready to play. Dinwiddie and DeMarre Carroll hit consecutive 3s during a 12-0 run. LeVert hit two straight 3s for a 14-point lead and the Sixers -- who had been the darlings of the city during the Process -- were soundly booed off the court by 20,000 fans ticked off at a supposed East contender. 76ers: Butler and Tobias Harris are both eligible for free agency and could stick around after they were acquired in mid-season trades. Team owner Josh Harris said both players could be resigned. "It's really hard to get good players of their calibre. Now that we've attracted them into our system, we're going to work really hard at keeping them around for a while," Harris said.